A very popular accessory for those who wish to keep the workout room efficient and organized. Owners will appreciate the solid rubber weight pads that are secured to each tray, protecting both frame and dumbbell/kettlebell. 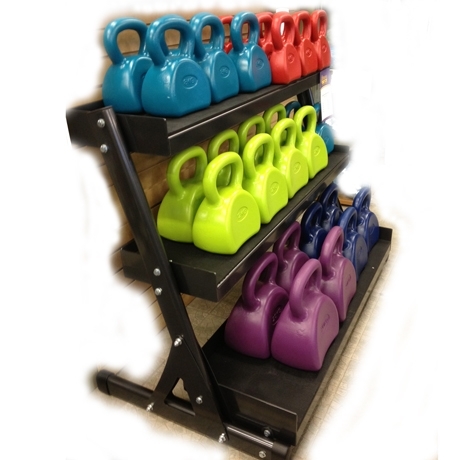 The Dumbbell / Kettlebell Rack has 2 tiers with trays 48" long by 12" wide, choose either to angle trays forward for dumbbells, or flat for kettlebells, or a combination of the 2 for accommodating both. The rack has an optional 3 tier tray (NLDBKBH42T) available. 2 trays 48" x 12"